Finally! Today! After weeks of waiting and a few too many hundred dollars, the oven is fixed. I baked these cupcakes over the weekend, though, and in a neighbor’s oven. The change of scenery threw me off. I made an ill-advised substitution (baking powder instead of baking soda) and the cupcakes didn’t rise enough. I should know better! The recipe, which I have made before, works, and so I am posting it here correctly. Yet another lesson… this one to take my own advice and follow the recipe! 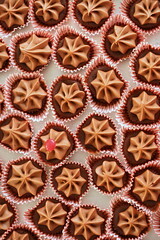 Despite the rising issue, the cupcakes still tasted great – rich and chocolatey with a warm and spicy finish. Pequin chilies are super hot (I got mine from Penzey’s) and the quantity that I call for below will result in a spicy, but not super spicy cupcake. So if you really want to shock someone, maybe you should double the quantity. It’s definitely a lot easier to adjust for heat with the frosting. Now that my kitchen is back in action I hope to be back soon with a more exciting recipe. 1. Boil water in a kettle then measure out 1-1/4 cup. 2. Combine chopped chocolate and cocoa powder in a medium sized bowl, add boiling water, whisk until smooth, set aside. 3. Sift flours, baking soda, and salt into a bowl. Add the ground pepper, set aside. 4. In a standing mixer, beat butter until creamy. 5. Add the brown sugar and beat until fluffy, about 3 minutes. 6. At medium speed, add eggs one at a time, beat well between each. 7. Add sour cream and vanilla and beat until combined. 8. Add about a third of the flour mixture, beat briefly until combined. 9. Add about half of the chocolate mixture, beat briefly until combined. 10. Repeat, adding flour, chocolate, then flour. Beat until just combined. Scrape down bowl if needed. 1. Heat the cream over medium heat until it bubbles around saucepan edge. 2. Place pepper and chopped chocolate in a medium sized bowl. 4. Let the mixture sit for about 30 seconds then start whisking it until smooth. 5. Add butter in pats and mix until combined. 6. set aside mixture and stir occasionally with a wooden spoon until cool. 2. Top with something red. I love pequin and tepin peppers (which are way cheaper in the barrio grocery) so I must try these. Yum. Thanks. i love your recipes so much…i am waiting for your cookbook to come out!!!! your cupcakes are so imaginative and unique!!! please consider a cookbook someday i would be the first to pre-order it!!! These sound wonderful! I wish I had these for the class I taught – “Hot Cupcakes for Cold Nights” They would have devoured them. Thanks for yet another awesome cupcake! Have a Happy Valentine’s Day with your family. Geez. Gorgeous. And I’m so jealous of your kitchen! As always, thanks. Going to have to give these a try – just happen to have a bag-o-pequin’s in the pantry! Totally worth it. Beautiful decoration. Can’t wait to try these. I love chili/chocolate combinations. beautiful kitchen — beautiful cupcakes too! your kitchen is so beautiful! and these cupcakes sound lovely. I am glad to see you back! These sound amazing! I haven’t tried the hot & chocolate combo yet, but I may have to. Your kitchen is charming! I love chocolate and chili’s together. Your frosting sounds wonderful! I am always inspired by your posts! I have a question though, your basic cream cheese frosting looks very thick in most recipes. I made it last night and it wasn’t runny, but it also was not thick. It was more goopy and sticky than anything. Is there a way to thicken it up? I used 12 oz. of low-fat cc, the butter, sugar, and vanilla. i am very extremely envious of your kitchen. these cupcakes are adorable. i love spicy chocolate and usually do it in brownie or hot chocolate form, but the chili-chocolate ganache is too much to resist. I absolutely adore cupcakes! Yays! What receipe is best for people starting out? I could spend forever in your kitchen. Wow, those are wonderful looking cupcakes! This makes me want to bake…right now! I dreamed i made cupcakes last night then I came across your blog this monrning. Fate is telling me something I think! Beautiful beautiful cakes. Thank you. these cupcakes are delicious! thank you for the recipe! everyone loved them; they had an almost intoxicating effect, something magical. interestingly, i accidently used bittersweet (valhrone 61% for both the cake and the ganache, but they turned out fine). can’t wait to repeat with 100% pure cocoa and pequins (which didn’t arrive on time) instead of arbols. nevertheless, everything was fantastic…consistency, texture, tones, taste…just perfect. thanks again, i’ll be back for more. I just wanted to let you know that I ABSOLUTELY love your blog. I check it very often and am trying to lern from you baking and blogging skills. Have you considered doing the adopt-a-blog that Dine and dish is doing?? If you do, PLEASE adopt me. Please? I need help, and you are STELLAR. Glad to have you back! I love the flavors combo of this one a lot, chocolate and chiles rock! 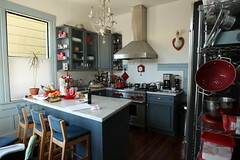 I think I already said this on Flickr, but I LOVE your kitchen. Those cupcakes look fantastic. I have my niece coming to visit me soon and she’s quite picky as well, I’ll have to give those a try. I also wanted to tell you that there is the cutest kitchen I have seen in a while. Gorgeous! Hi Cheryl, do you why the cupcake papers pulled away from the cupcake like shown in the pictures? It happened to me before. (different recipes) Appreciate your expertise. I wanted to Thank you for your great blog and specifically for the post about frostings and even more in detail for the frosting recipe above. I modified it only slightly and the results were exactly what I was looking for. 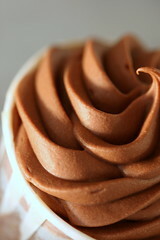 i have just recently stumbled upon your blog while searching for a chili chocolate cupcake recipe and I found yours. I spent a bit of time going through it and I love your site and the detailed instructions in your recipes. I agree with some of the posts here,you should publish a cookbook soon! I am a humble baker – beginner and wonderful to see your creations, it is inspiring. thanks for sharing!